That year’s Escape Plan made little dent at the box office, as it earned a mere $25 million at the US box office. Stallone and Schwarzenegger had already appeared together via the Expendables movies, so maybe those have audiences enough of the two – or maybe Plan just didn’t appeal to people. Ray agrees to ply his trade at a new, super-charged facility called “The Tomb”, but he finds himself double-crossed and imprisoned for real. With no fallback, he needs to execute an actual breakout, and Ray pairs with inmate Emil Rottmayer (Schwarzenegger) to do so. Escape Plan appears in an aspect ratio of approximately 2.40:1 on this 4K UHD Disc. Across the board, the transfer looked good. Downconverted to Dolby TrueHD 7.1, the film’s Dolby Atmos soundtrack added breadth to the experience. The movie didn’t deliver a consistently rock-em-sock-em soundscape, but it managed to open up well. How did the 4K UHD compare to the Blu-ray version? The Atmos audio seemed similar – it added a little breadth but remained largely comparable to the Blu-ray’s 7.1 affair. Visuals also demonstrated a mild boost, as the 4K showed somewhat superior definition along with stronger brightness/contrast and more dynamic colors. Don’t expect a substantial improvement, though, as the 4K brought an incremental step up from the Blu-ray. It’s better but not a night/day difference. A second disc provides a Blu-ray copy of Plan. 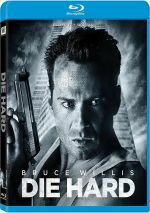 It includes the same extras as the 4K and adds promos for Divergent, The Last Stand, Dredd and Expendables 2. No trailer for Escape Plan appears here. 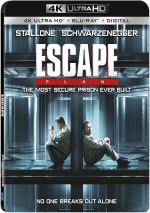 Fans of 1980s action cinema will thrill to the sight of Sylvester Stallone and Arnold Schwarzenegger on-screen together, but that novelty exists as the only appealing aspect of Escape Plan. The movie moves slowly and never turns into a satisfying experience. The 4K UHD boasts generally solid picture and audio along with a decent array of supplements. This remains a forgettable action effort.